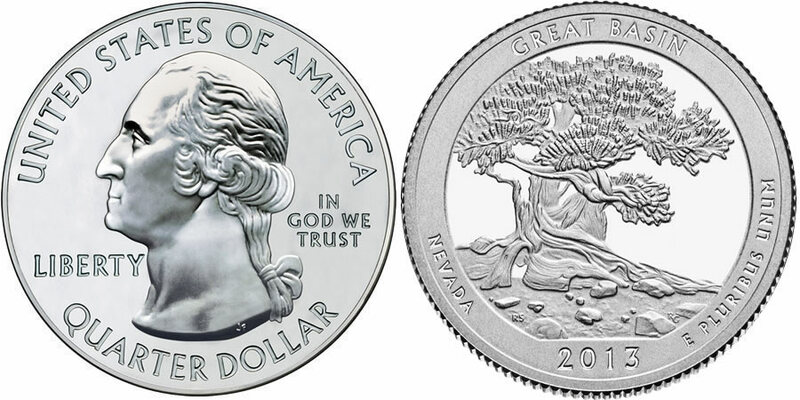 The third of five 2013-dated strikes offered by the US Mint under the America the Beautiful Quarters® Program is the 2013 Great Basin National Park Quarter. On the reverse is a design emblematic of Great Basin National Park located in the state of Nevada. Coins of this series are typically struck for circulation at the US Mint's facilities in Philadelphia or Denver. The minting facility can be identified by looking for a mintmark on the obverse of the coin. A 'P' indicates it was struck in Philadelphia whereas a 'D' indicates Denver. The US Mint has also struck America the Beautiful quarters at its facility in San Francisco. These coins, some of which are also circulation quality, are struck solely for collectors. Great Basin National Park is located about three hours north of Las Vegas. The site only became a national park in 1986, but portions of it have been under federal protection since 1922. In that year, Congress had created the Lehman Caves National Monument which was absorbed into the larger newly created national park. A portrait of George Washington, the first President of the United States is found on the obverse of all America the Beautiful related coins. It was originally designed by John Flanagan and has been seen on quarter dollars since 1932, with some modifications. Inscriptions of UNITED STATES OF AMERICA, QUARTER DOLLAR, LIBERTY, IN GOD WE TRUST and the mintmark are also seen on the obverse of the coin. Showcased on the reverse is a design emblematic of Great Basin National Park of Nevada. Surrounding that design are the inscriptions of GREAT BASIN, NEVADA, 2013 and E PLURIBUS UNUM.